While we are in between houses, I’ve been scouring Pinterest like a mad woman, searching for possible decor and organization solutions for our new house. 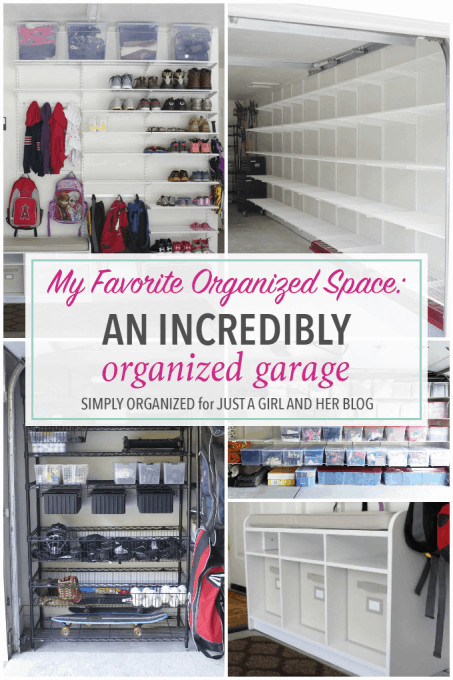 When I came across this organized garage from my friend Samantha at Simply Organized, it stopped me in my tracks– it is absolutely incredible! I’m so delighted that she agreed to share it for the My Favorite Organized Space series. I’ll let her show you around! Hey everyone! I’m Samantha from Simply Organized, a professional organizer by day and blogger by…well, whenever I can find the time! I absolutely love blogging about organization, but what I love more is the friendships created just from writing and sharing content online. Abby is a great blog friend and I was so touched when she asked me to join this fun series. I mean, hello – hard for me to say no to anything organizing related! But also hard to say no to her cute face! When people find out I’m a professional organizer, they suppose my house is perfectly organized. Everything in its place. Clean, tidy and well-sorted. Laundry washed, folded and put away. Not so true. I have 3 children that are not so organized (much as I teach) and we live a busy, full, fun life. What has been the key to organization is simply having systems in place…so when I want to pick up and organize, it’s easy with minimal effort. These are the same principles I teach my clients. While every space in my house does have a system, I have to admit one of my favorite spaces isn’t even inside…it’s outside. It’s my garage! How do you and / or your family use this space day to day? When it comes to an oversized space like a garage, my number one tip is to create zones. My next tip would be to use as much vertical space as possible. Remember, it’s a garage…so use all of that glorious wall space! By adding a wall-mounted shelving system, I was able to customize a space dedicated to backpacks, sweaters, shoes, socks and even high storage for stowing out of season / bulky clothing. I love that the shoes have somewhere to live. Since we come and go from the house through the garage, this was a natural landing spot for a mudroom. With 9 drawers, 2 shelves and a spacious table top, I’m able to get a lot of projects accomplished at home – and if I can’t finish a project, there’s a dedicated space where it can sit until I have the time to revisit. I managed to also create a small work-out space in the center of the garage which has been especially useful while the kids are home this summer. This wall of shelving not only allowed me to contain everything from holiday decor to camping gear to toys currently out of our playroom rotation, but it also free’d up a ton of space on the opposite wall. To make the space functional and organized yet still beautiful, I painted the entire garage a bright white. And whenever possible the shelving I choose is white. Besides being able to find everything, it makes the space look even bigger and brighter. I’ve also incorporated runners and other rugs in the space to keep those zones defined while also providing soft surfaces for bare feet. We have a lot of bare feet people in this house! We had a gently loved oversized outdoor rug that was without a home after we moved here. Turns out it made the perfect landing spot for bikes. The kids know to park bikes here so mom doesn’t trip on her way out the door. This carpet, the runners and the bright white walls make the space look clean, pretty and spacious. And I love clear containers! Do you have any funny/happy/sweet/interesting stories about this space? We’ve had so much fun living in and loving this space, but I’d have to say the most interesting story is that it was featured in a book! Abby and I have a fellow blog friend, Toni of A Bowl Full of Lemons, who wrote an amazing book called The Complete Book of Home Organization. Her publisher contacted me to see if I was interested in having a space featured and of all the spaces I submitted – turns out, my garage stole the show! It was an honor to share this useful space in her book and truly hope it inspires everyone to do it themselves. This garage really is my favorite space! Our garage is my favorite space because it’s functional. It’s added another room (or more) to our home that we live in and enjoy! We can play together, workout, work on projects and to be totally honest, I feel more inspired to get things done when I can find and see it all. Having an organized garage motivates me to work on projects because I can easily find my tools and other gadgets. Thank you so much for checking out my favorite space and a big thank you to Abby for inviting me! I do love the mudroom area. Perfectly useful! I built an entire wall of shelves in my garage and I couldn’t be happier with it. So much storage room! The best part? I actually have a couple of shelves open with nothing to fill them with. Loving that! So where does she put her car/cars? Ahhhh! 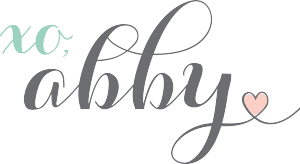 So fun to be hosted here on your site Abby! I hope you guys are doing well between homes…and can’t wait to see you in Atlanta NEXT WEEK! Yay!!! Thanks so much for joining us today, Sam! SO looking forward to seeing you, too! Woohoo! Hi, Sonya! It’s the Elfa from The Container Store. She talks more about it here: http://www.simplyorganized.me/2016/03/simply-done-garage-shelving.html. We used the Elfa system in Donnie’s office and we LOVE it. Have a great weekend! This is great! To see that you are able to store seasonal items is awesome as I’ve seen before that getting to decorations for the holidays is not very accessible in some garages. I also think it’s great that the kids have easy access to their belongings which helps them be more independent and gives them the responsibility to put things away. Thanks for sharing. This is great inspiration! Right now our garage is a mess and we just kind of threw everything in there when we moved, so I need to clean it out. Thanks for all the ideas! That is the most impressive garage organization I’ve seen so far. I like the wall mounted drawer and that table top! Just wondering what that thing hanging on the wall? That mudroom bench is great to have! What a helpful post! Thanks for the great post. I am asked for ideas about all things garages, especially maximizing storage, on a daily basis being in the garage door business. I am not a very organized person so I will share your ideas when asked about storage. Have a great day. So glad it was helpful, Frank! Have a great week! What system did you use for the “entire wall of mounted shelving”? I would like to do that in our garage but there is no reference to what type of system you used. I love it all. I just wonder if you live in a warm country to be able to use your garage like that or is it heated. I second Betsy’s question. What system did you use for the entire wall shelving? Hi, Pam! This was actually a guest post but it looks like she used the Elfa system from The Container Store. She wrote a post about it here: http://www.simplyorganized.me/2016/03/simply-done-garage-shelving.html. Hope this helps. Have a great day! where can I purchase the wall of shelving with the plastic storage bins? Just what I need for my garage. Hi, David! The shelving is Elfa from The Container Store. Donnie used it in his office as well and he LOVES it! Hope it works out! Have a great evening!